b) Before switch on, grinding disc should be on the grinding surface, the pressure not be hard,, then turn the disc by hand, listen the voice to make sure it is normal, switch on the motor and adjust the pressure to the best area by the handle. 1、Connected power supply, switch on and have a check to make sure it can works well. Swing arm can be adjusted by motor lifting and down, spindle center position can be changed by handle adjustment. 2、Place the valve on workbench, screw firmly, choose appropriate grinding disc installed on the grinding seat, stick grinding paper. 3、Switch on lifting motor and down the swing arm to a suitable location. 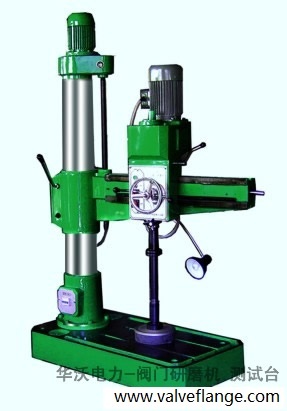 Push the swing arm, move the spindle box, make sure grinding disc face the valve sealing surface, swing arm to the appropriate position, locking swing arm and spindle box.